This is just one of many images shot with black and white film produced by the Japan Camera Hunter: JCH StreetPan 400. I used both orange and red filters, and the success shows in good contrast, for both long and short scale. The Oly OM-1n and 50mm lens are a wonderful travel combo – small, lightweight, and well made. This is one of the cliff dwellings found in Mesa Verde National Park, in the Four Corners area, in Colorado. We spent a couple of days there, enjoying the rich history and beauty of the area. 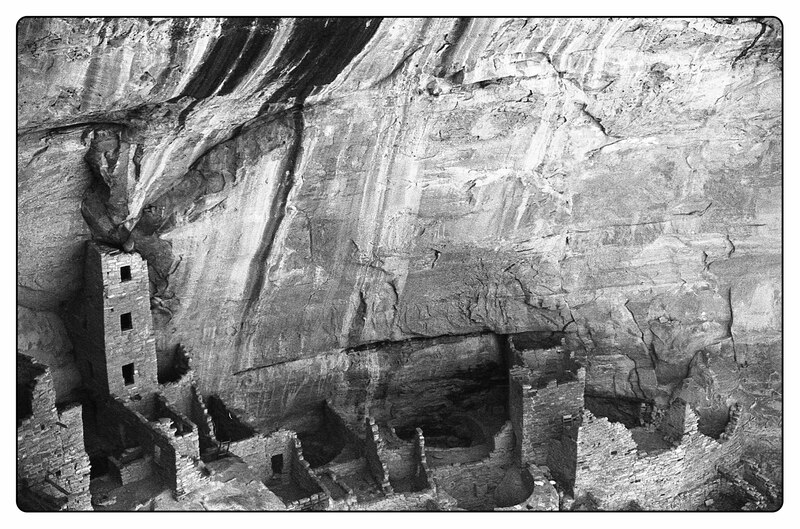 This entry was posted in Glimpses and tagged analog, black, cliff dwelling, Colorado, film, film. landscape, Japan Camera Hunter, JCH StreetPan 400, Mesa Verde, Olympus OM 50mm f1.8, Olympus OM-1n, white. Bookmark the permalink. Love the tones here—scanned on the Pakon, or elsewhere? Same issue I had with my Pakon–I don’t think it is the DX coding, but rather the Acetate base.